Awesome example from a limited edition of only 60 pieces worldwide. The Fender Wide Range humbucker at the bridge is factory-fitted, the pickguard with the Fender Custom Shop pickup was added later. + + + Comes with original case, accesories, documents, certificate. 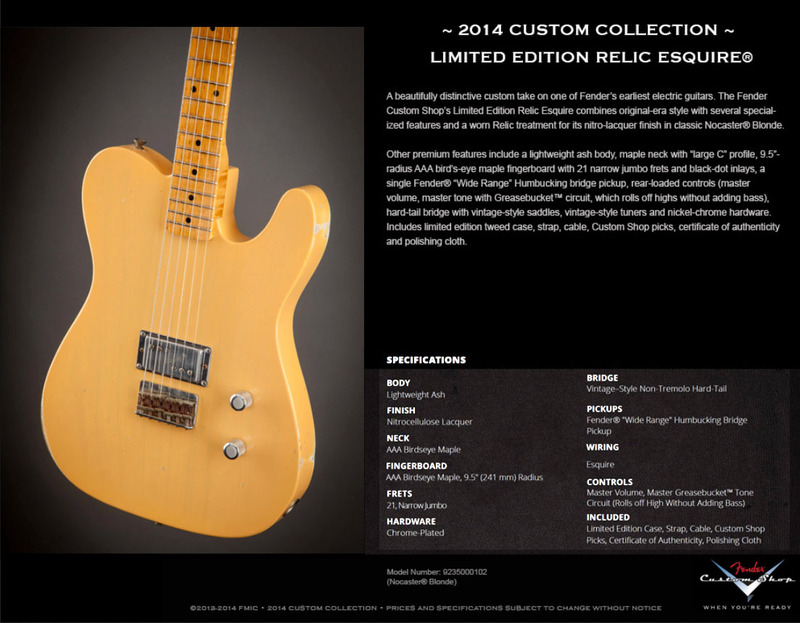 + + + "Limited Edition Relic Esquire. Maple Fingerboard. 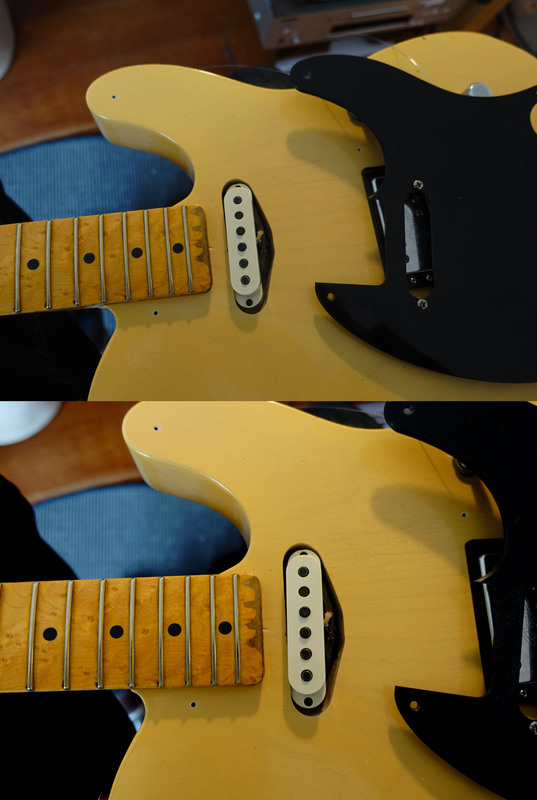 Nocaster Blonde. Model Number: 9235000102. Series: Limited Edition. Color: Nocaster Blonde. Body Material: Lightweight Ash. Body Finish: Nitrocellulose Lacquer. Body Shape: Esquire. Neck Material: AAA Bird's-Eye Maple. Neck Finish: Nitrocellulose Lacquer. Neck Shape: Large "C". Scale Length: 25.5" (64.8 cm). Fingerboard: Maple. Fingerboard Radius: 9.5" (241 mm). Number of Frets: 21. Fret Size: Narrow Jumbo. Nut Width: 1.650" (42 mm). Position Inlays: Black Dot. Neck Plate: Chrome-Plated. Bridge Pickup: Custom Fender Twin Head WR Humbucker. Controls: Master Volume, Master Greasebucket Tone Circuit (Rollsoff High Without Adding Bass). Bridge: Vintage-Style Non-Tremolo Hard-Tail. Hardware Finish: Nickel/Chrome. Tuning Machines: Vintage-Style. Unique Features: Rear-Load Controls. Included Accessories: Limited Edition Case, Strap, Cable, CustomShop Picks, Certificate of Authenticity, Polishing Cloth. 60 Units Produced World Wide."